Sales of seasonal beach tags for summer 2016 started last week. 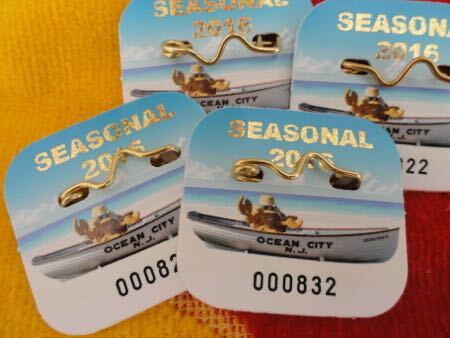 Beach tags for the summer 2016 season are on sale now online and at four locations in Ocean City. A $5 discount on seasonal tags is good through May 31. The 2016 beach tag features Ocean City mascot Martin Z. Mollusk waving from an Ocean City Beach Patrol rescue boat. The online store for beach tags can be accessed 24 hours a day at store.ocnj.us. Mail order forms are also available online. The 2016 preseason beach tags are available for $20 and are required for beachgoers ages 12 and up. On June 1, 2016, seasonal beach tags prices increase to $25. Free beach tags for active-duty military members and veterans will be available in the spring. For additional information, visit www.ocnj.us/beachtags or call 609-399-6111. The fees for weekly beach tags ($10) and daily tags ($5) will remain unchanged in 2016. They will not be available for purchase until the season starts.